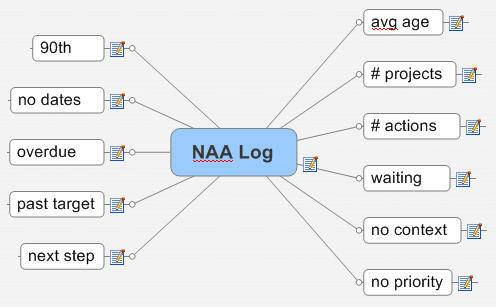 The Next Action Analysis macro has been updated to log your scores into comma delimited notes on a mindmanager log map each time you run it on your ResultsManager daily action dashboard. The central topic note contains the date/time stamp, the overall score, and each dimension’s score. The branches contain tables with the actual values of each metric. You can paste the results into Excel and generate a trend of your overall score or of any of the 11 metrics. Note that the scoring has been adjusted to encourage more context assignment. For background on the tool see previous posts or its wiki page. I installed the latest version of Next Action Analysis and now I got a problem. When the macro has posted the question about on-line tips it stops and doesn’t complete the process. MM end up in a “not responding” state. I am running MM7 SP2 Beta. That’s odd. I’ve been using it with the beta on one machine without any issues. Does it lock up after you respond to the advice question or before? If after, does answering “no” help? There is a constant at the top of the code (showadvice=true). If you change it to showadvice=false it will skip over that step. That should get your working again, but I’d like to get to the bottom of it if possible. I just uploaded a new version that will skip the prompt and automatically show advice if askadvice=false. I had made some installations of other software/add-in and it turned out to be a conflict between your macro and the new add-in mind2chart . Once I removed mind2chart naa works just fine.